My healthy recipes have taken a hit lately, what with all my visitors and not having any time to really cook at all (there are far too many restaurants to show them!). My best friend in the world is in town right now and I am determined we shall make some meals together, but we have been traveling and eating out for the past week and before that I was quite busy at work, so apologies for the long break in between posts! I shall make up for it by sharing an actual healthy recipe that is quite easy to make (just a bit of prep time) and utterly delicious. Sweet potatoes and kale combined together are just antioxidant superfoods to the max, and I really like that the balls are baked instead of made in a pan, because then you get no excess oil at all, which is great. Using the parchment paper prevents them sticking and there are just no added sources of fat in the dish at all…but they are still super flavourful. Win. The best part about them is that they taste great hot or cold, and it’s a great snack to reach for when you are wanting something in the afternoon but don’t want to load up on carbs or chocolate (something I have been doing all too often recently). They aren’t really substantial enough for a dinner, but you could combine them with other things and it would work (I’m thinking roasted veggies, salad, etc). Give them a try and enjoy your new healthy snack option! Ground flaxseed, for sprinkling – I don’t have any of this and it’s not necessary, but I did have some dukkah so I rolled them in that. You could sprinkle with sesame seeds if you wanted or just leave them plain! Preheat the oven to 400ºF/200C. Line a baking sheet with parchment paper. Place an inch (2.5 cm) or so of water in the bottom of a medium pot. 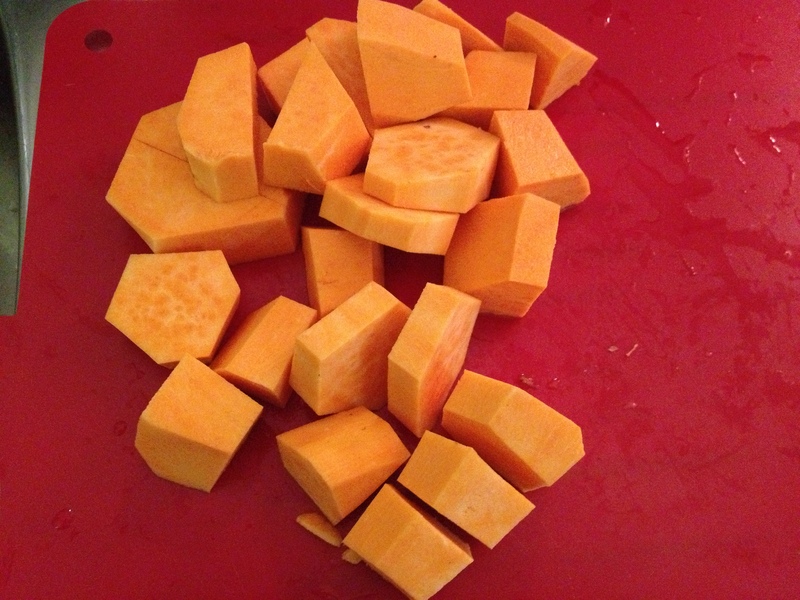 Add in the sweet potato and bring the water to a boil (the water should just cover all the sweet potatoes). I don’t like raw onion so I decided to soften my onion along with the sweet potatoes in the boiling water as well. 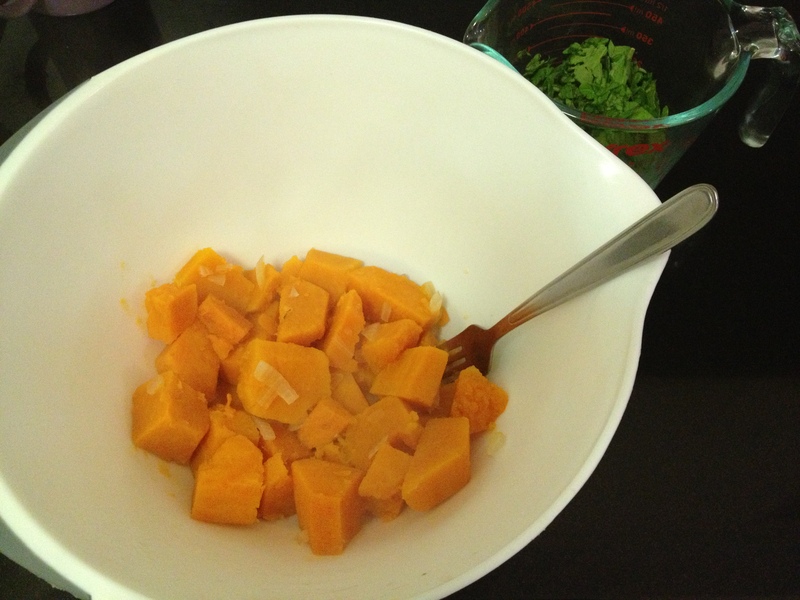 Check it after about 10 minutes – the sweet potatoes should be very tender when poked with a fork. They need to be mashable so wait for them to become soft. It shouldn’t take more than 15 minutes. Drain them and then place in a large bowl. Mash them until smooth. Stir in the kale, shallot/onion (if you hadn’t added it to the water), cumin, granulated garlic, and salt. 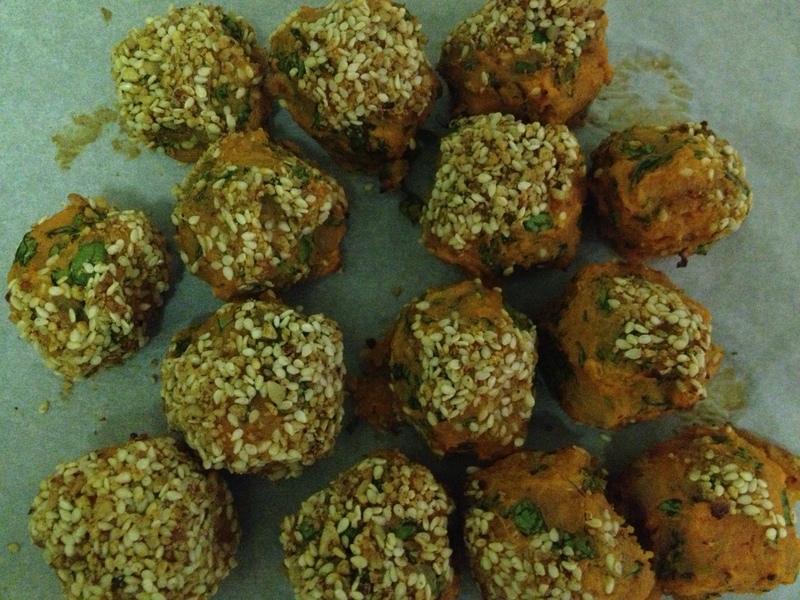 Using slightly wet hands, form the sweet potato mixture into 1½ – 2 inch (7.5-10 cm) balls. Place the balls on the lined baking sheet. Sprinkle lightly with ground flaxseed if you are using, or roll them in dukkah or another seed if you have it, or just leave them plain. Bake for 20-25 minutes until just firm to the touch but still slightly soft. Cool for at least 5 minutes before serving. Makes 10-15 balls, depending on how large you make them. You can store them in the fridge for several days. 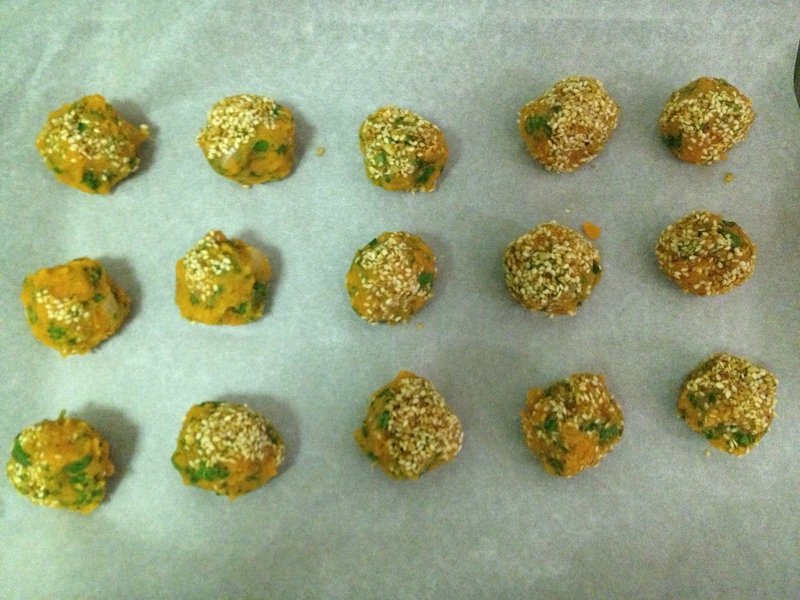 These are an utterly delicious snack, or they would be great served over a green salad. I found them equally addictive warm when they came out of the oven and cold out of the fridge a few days later. I definitely loved the touch the dukkah added to them, but if you don’t have any I’m sure they will taste absolutely delicious plain as well. I just wish I’d made a bigger batch because they definitely disappeared very fast. 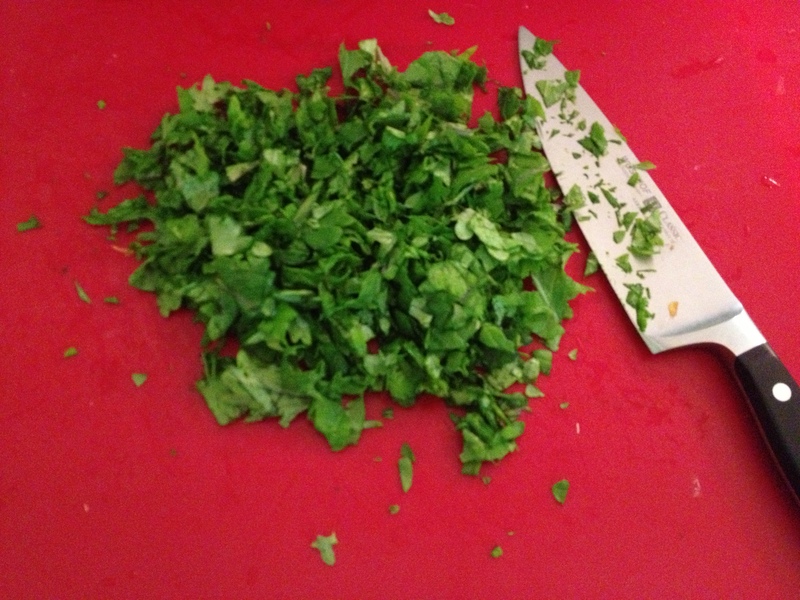 You could get creative and add other things to them as well, such as finely chopped broccoli or cauliflower for even more veggies. Eating veggies in ball form is of course genius and I shall have to do it more often.